“Women in our countries have no self-confidence when it comes to finding work, as we do not work out in the community. But this project opens doors for women,” says Kurdish Aria Ahmadi, who is 24. In a perfectly ordinary, small conference room on the first floor of the Eskilstuna job centre, the world is opening up. Aria Ahmadi is one of 15 women taking part in project Mirjam, a gender equality project financed by the European Social Fund ESF. It is aimed at women with low levels of education who are far outside of the labour market. The room is full of women of all ages and many different nationalities. Five interpreters are needed to translate what is being said into the languages represented in the room. Today the Swedish Forest Agency is visiting. They are looking for 18 participants for a one year long nature project, where those who get hired will be taught how to take stock of trees, clearing forests, maintaining cultural monuments and nature service areas and much more. They would like to recruit both men and women, and now try to get the women interested in what traditionally has been seen as male-dominated work. The Forest Agency has been given this task by the government, and the idea is to allow the participants to try many different things and learn how the Swedish labour market works. The job is covered by a collective agreement, but does not lead to permanent employment. “Look at it as an opportunity to get a reference from the Swedish labour market. Work experience is very important in Sweden and highly valued by employers,” says Anna Wilder, who runs project Mirjam in Eskilstuna together with Gianna Michelotti Husblad. The visit from the Forest Agency is a typical example of what project Mirjam is about. Using study trips and invited guests, it aims to break down prejudices about what is considered to be typical male and female jobs. The other week the course participants were taught about green jobs. “Through Mirjam we get to learn about how women can work in Sweden, and that there is no difference between men and women,” says Aria Ahmadi. Project Mirjam began in 2016 and will run until January 2019 in six different places across Sörmland and Östergötland. So far some 500 women have attended the ten weeks long course. The aim is to get the women into work or education after their introductory phase, as well as finding ways of shortening the road to employment. One way of doing this is to show the women which job opportunities exist in more male-dominated occupations. During the ten weeks, the women meet three hours a day, five days a week. During this time, they also study the Swedish language. They are put into groups and given guidance in how the Swedish labour market works, with a focus on gender equality. They cover issues like terms of employment and how to achieve a good work-life balance. “This daily contact allows us to get to know the women, and to see their experiences and skills. Even though none of them have more than ten years of schooling, and are called low-skilled, they have after all been working, albeit mostly for free,” says Gianna Michelotti Husblad. “We see a clear difference from day one to the end of the ten weeks. They grow and understand that they know more than they thought they did. One of the more important things has been for them to hear employers tell them ‘we need to hire more women’. Our goal is for them to approach the Swedish labour market and understand that they can get jobs,” says Anna Wilder. Each week the participants visit two different workplaces. Sometimes the participants are amazed. This happens when they see a modern factory, or any environment or workplace where women work – even well into their pregnancies. For many, this would be unthinkable in the countries they came from. Special inspirators are invited every week to talk about how to set up a company, about their career or their life journey. Each course participant is also given a mentor. “Our study visits become a meeting place between employers and the women, and we see that they become interested in these women. They see that there is a will here,” says Anna Wilder. There can be big differences between the different women’s education and experience. Each group usually have some illiterate people, who need to be given many partial goals since the road to employment for them is long. “When you talk about women with low education it is important to realise that this is no homogenous group. Some might not have attended school at all, others went to school for five years and some have got as far as starting their upper secondary education. What we do is to lift their experiences and skills, and look at what they have been doing before, regardless of their education levels,” says Gianna Michelotti Husblad. Aria Ahmadi is one example of how little a term like ‘women with low levels of education who are far away from the labour market’ actually means or explains. She does tick the boxes for participation in project Mirjam – not having more than ten years of schooling – but she speaks Kurdish, Persian, Arabic, Turkish, English and very good Swedish considering she has only spent a few years in Sweden. “I manage without an interpreter,” she says, and this is absolutely true. She has been a refugee all her life. Born in Iraq, she was five when she fled to Turkey on foot with her family. But being Kurdish became increasingly difficult in Turkey, so she and her family fled again. This time on what she calls ‘the boat of death’, and a deadly dangerous journey to Greece. She has now got a permit to stay in Sweden, and sees two alternatives for a future job. She would like to be either a nurse or a pharmacist. “I want to try to forget about my past, and start a new life. I want a good education, and to work with people. I want to be able to give something back to my new country,” says Aria Ahmadi. She is very happy to be able to take part in project Mirjam. It has helped her understand the labour market and what skills employers are looking for. She lists what Swedish employees should possess: Self-confidence, good listening skills, punctuality, taking responsibility and having a positive attitude to other people. “It is very important to understand how to relate to other people when you arrive in a new society. 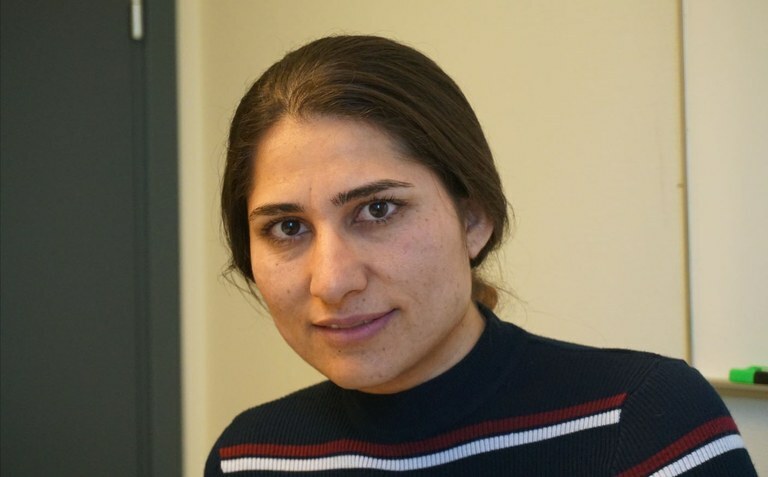 It is also important to learn how to stand on your own two feet and become independent – this does not happen in my native country of Kurdistan, since we have no right to go out and find work,” she explains. Eman Murad arrived in Sweden in the autumn of 2015 and turned 50 on the day she arrived. She finished her upper secondary education in her home country, and worked as a facilitator in a preschool. She arrived with her husband and two children. Eman Murad is not particularly tempted by the Forest Agency’s offer of working in the forest. “I hate the cold,” she says. She is, however, happy to be part of project Mirjam. “It is a wonderful project and I learn things I did not know before. We learn that women can, for instance, be bus drivers, taxi drivers or cleaners. This is not common in Syria. I did not know that there are so many occupations where women can work,” she says. “But perhaps the best thing of all is that I dare talk more now, and I understand far more Swedish. I feel I am getting experienced when it comes to jobs, society and language,” she adds. Eman Murad believes her age is the greatest obstacle for entering into the labour market, not the fact that she is a woman. Her daughters quickly found jobs in Sweden, even before getting their residency permits or learning the language. They now have permanent jobs. She has herself applied for different jobs now, but so far there have been no answers. Yet things are beginning to look up. After a visit to H&M’s warehouse, she has been called in for an interview for a summer job. “A lot is expected from us. So it is important that we are being encouraged to take the first step, and that does happen here,” says Eman Murad. She is now worried that she has only a few years left to get into the labour market, but if she had the choice she would work with food. That is something she knows how to do. The three years long project Mirjam is nearing its end. The last group will start in less than one year from now. A more comprehensive assessment will soon be published, but you can already see that more women have found jobs and more have sought work in male-dominated workplaces. In Eskilstuna some 75 women have taken part in the project, or are doing it right now. Five of the women in the current group will join the Forest Agency’s project, six women from previous groups have found work and some are getting started. Several others have begun studying. But perhaps the most important thing is that the women have been given hope that they will be able to find work. “It is important to do something for these women, and it has been a privilege to see them grow. We don’t usually hug at work, but here we do. We become so close,” says Anna Wilder. Anna Wilder and Gianna Michelotti Husblad in project Mirjam in Eskilstuna (above). The project started in Januari 2016 and runs until January 2019 in six different places across Sörmland and Östergötland. So far some 500 women have attended the ten weeks long course.